The LiquidLogic Braaap 69 is a uniquely designed kayak that sits somewhere between a modern slalom kayaks hull shape and whitewater creeker. Nothing else on the markets comes close to it design and performance on the water. The Braaaps hull shape and slicey back end make it both fast and super manoeuvrable, dip the stern underwater and pivot on the spot to point and accelerate in a different direction. Huck it off drops, throw it into tight lines, bounce it down slides and off rocks, surf, pivot, and ender your way to the biggest end-of-day smile you’ve ever had. The Braaap 69 is an easy boat to roll, and a perfect boat for learning edge control on moving water. However, we would suggest this kayak is best suited to more experienced paddlers. Relaxed paddlers or beginners will find the Braaaps hull turns off line easily & harder to control compared to boats with less rocker. 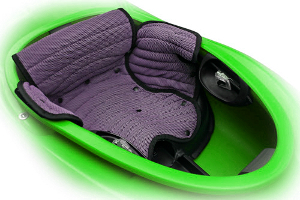 The performance offered by the Braaaps hull is outstanding and will result in a different style of white water paddling. With plenty of play performance, the Braap in the right hands will also run the hardest rapids with style. We offer a delivery service for the Liquid Logic Braaap 69 to home and work addresses throughout England, Wales, Scotland, Northern Ireland & Ireland. Buy a Liquid Logic Braaap 69 online from our website and collect from our store in Newhaven, East Sussex or from any branch within the Canoe Shops Group. There is no cost associated with this*.